NEWS: A dynamic digital training programme at Tesco that is helping to deliver grocery code compliance has won a major award. 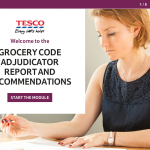 Tesco’s Groceries Code Adjudicator Report and Recommendations module, created with elearning company, Sponge, won the silver prize for compliance at the Learning Technologies Awards 2016. Tesco introduced the training in the spring this year to retrain colleagues to ensure that they were Grocery Code Adjudicator compliant. Using a mixture of elearning, face-to-face training, coaching and system guides, Tesco was able to deliver training to nearly two thousand finance staff and food buyers in less than three weeks. Leading digital learning supplier, Sponge created an elearning module and a video capture of Tesco’s face-to-face training as part of the campaign. The Learning Technologies Awards saw more than 400 entries from across the world with Tesco’s category - ‘Best use of learning technologies to ensure compliance’ - among the most competitive. Sponge has worked with Tesco since 2014 and previously won a bronze award in the same competition for delivering compliance training for the retailer.